A bow tie consists of a ribbon of fabric tied around the collar of a shirt in a symmetrical manner so that the two opposite ends form loops. These pre-tied bow ties are ties in which the distinctive bow is sewn onto a band that goes around the neck and clips to secure. Our poly woven bow ties, hanky and cufflinks for men offer the perfect blend of quality, affordability and style. Dress to impress for events or special occasions for a fraction of the cost. SIZE INFORMATION: Bow Ties are 4.75 Inches long and 2.5 Inches at the widest point. Hankys are 10" Square. THESE ARE QUALITY MADE BOW TIE, offering a noble and classic design to suit your needs, it is soft, light weight and exceptionally comfortable. 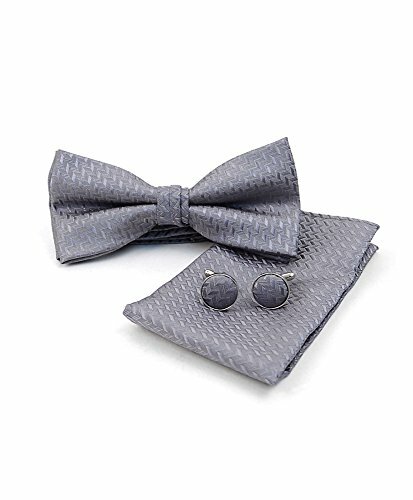 THESE FASHIONABLE 12pc BOW TIE, CUFFLINKS & HANKY SETS are perfect for weddings, semiformal events, formal events and etc. EACH BOW TIE has an adjustable band that can be made to be short or long and fits most men neck. If you have any questions about this product by Umo Lorenzo, contact us by completing and submitting the form below. If you are looking for a specif part number, please include it with your message.